Baruwa Enterprise Edition is a fully fledged Mail Security solution, based on a blend of best of breed open source and proprietary software packages. It provides protection from spam, viruses, phishing attempts and malware attacks. Baruwa Enterprise Edition works with any standard SMTP server, is highly accurate, scalable, easy to integrate as well as manage. Automated installation, configuration management tools and an API with several API Libraries are provided to ensure the efficient and easy management of the System. You can even craft your own Infrastructure as Code deployment solution using SaltStack and our packaged salt states. Also included is reporting functionality with an easy to use query builder, whose results can be displayed as message lists or graphed as colorful and pretty interactive graphs. Built in Full text search functionality allows you to find information very fast and easily. Advanced searching options available in leading web search engines are supported. Baruwa Enterprise Edition is built on an open source core and runs on a slimmed down and customized Linux OS based on CentOS. All the bloat has been trimmed leaving only an OS dedicated to email security. Baruwa Enterprise Edition can be installed on Premise or in the cloud. It operates as an Email security gateway accepting mail from untrusted sources, running extensive checks on it and then passing the clean mail to the destination. It does not support the hosting of user mailboxes. For incoming messages, it is configured to accept mail on behalf of your internal mail server run extensive checks on it then forward the clean mail to your internal mail server. For outgoing messages, your internal mail server can be configured to pass all outbound messages to it for processing before being sent on to the destination. From the internal servers point of view the system is its smart host. It can operate as a standalone all in one solution or as a cluster of servers. Clusters are made up of frontend and backend segments. In the frontend segment the traditional concept of a cluster master is not supported, all the nodes in the cluster have equal status and can be brought into and taken out of the cluster without any special changes. Backend segment clustering was introduced in version 2.1.7. No limits on domains and users add as many as your hardware can support. Baruwa Enterprise Edition is available under a PAID subscription, subscriptions can be paid for monthly or annually. There are NO restrictions or limitations on the number of domains, email addresses and users that you can configure on your systems. You are only limited by the system resources on your hardware. Unlike competing products we do not charge based on the number of domains or users. Subscription are purchased via the Baruwa website, using PayPal or PayFast. The order system is automated, as soon as PayPal/PayFast processes the payment and notifies our system your subscription will be generated and the subscription details emailed to you. This should take no more than 5 minutes. If you do not receive email confirmation of your subscription within 15 minutes please contact Support. 30 day Trial subscriptions can be obtained via the Baruwa website, a valid PayPal/PayFast account is required to access the Trial subscription. There is no obligation and the Trial can be cancelled at any point within the 30 Days. Refer to Why do you require a PayPal/PayFast account for the 30 day Trial ? for the reason why a valid PayPal/PayFast account is required. NOTE: The amount of resources allocated to system is directly related to the amount of email the system will be processing as well as the number of users connected to the web interface. Baruwa Enterprise Edition can be configured in various topologies. Standalone which is the default configuration, and works well in small scale environments in larger environments with higher mail volumes and user numbers as well as stricter uptime requirements clustered topologies should be used. The supported clustered topologies are described below. In this topology all the backend components are each installed on standalone systems and the frontend components are also installed on standalone systems. This solution is the recommended for very large environments as it performs better and scales out and in easily. In this topology all the backend components are each installed on standalone systems and the frontend components are combined on to a node. 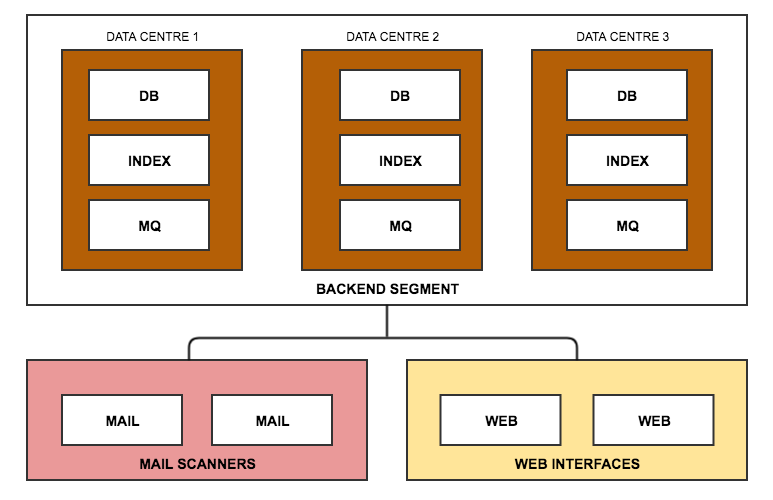 Scaling is achieved by growing the frontend or backend cluster segments. In this topology all backend components are installed on a single system and the frontend components are each installed on standalone systems. Scaling is achieved by growing the frontend or backend cluster segments. In this topology all backend components are installed on a single system in and the frontend components are combined on to a node. 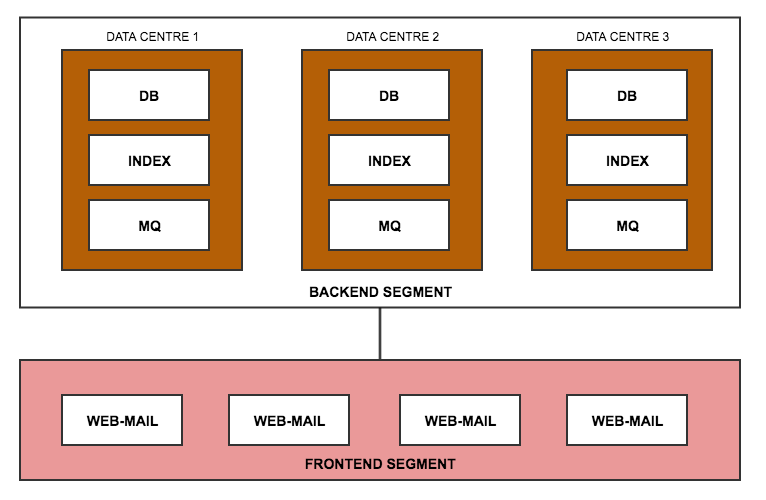 Scaling is achieved by growing the frontend or backend cluster segments.